Time for a brunch date! Every couple needs a brunch date once in awhile so Jacky and I decided to go near the water and dine at Provence Marinaside at Yaletown. We got there at around 11am and there was already a line up but luckily since it was only a table for two for us, we got seats once we got in. I was hoping to get a seat next to the window with a view of the water and yachts outside but what are the chances on a Sunday brunch day right? I was surprised that the restaurant was bustling with people and noise. I expected a quieter and formal dining experience but it looked like it was suitable for anyone and any time. Our server was very nice at the beginning and then when the bill, came my opinion changed. Here’s the story: I treated Jacky to brunch and when the bill came, I took the machine and inserted my credit card just like everyone would do. This paying experience was probably the most awkward one I have ever gone through. The server was standing really close to me and she was looking at while I was typing into the machine the whole time, even when I was typing in my PIN! I couldn’t focus on how much tips I was supposed to give them and by accidentally gave them less and she asked me if there was anything wrong. Thoughts and comments? Jacky went with the highly recommended Croque Monsieur Benedict (CAD14.00) with black forest ham, gruyere cheese, sundried tomato butter on focaccia, potatoes and fresh fruits. I had a bite and I would say that the sundried tomato was so juicy and savoury with the focaccia making this a very hearty and flavourful brunch. 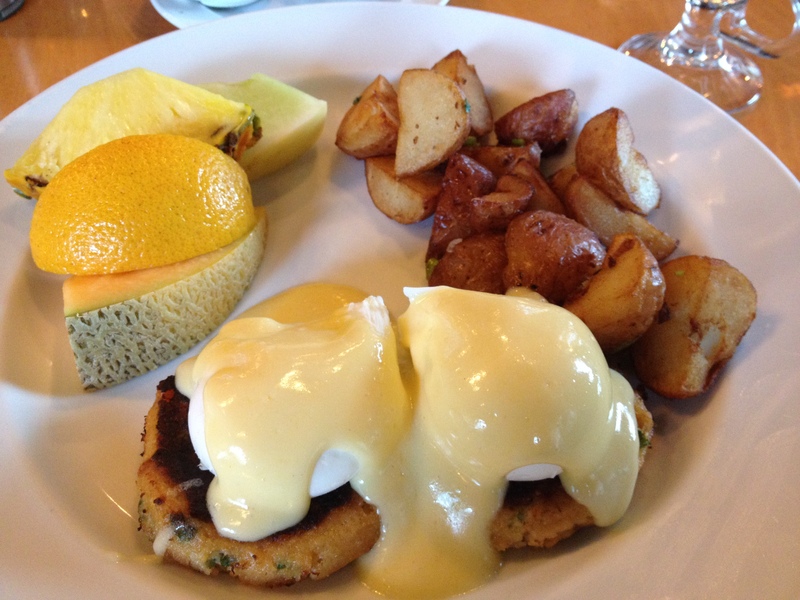 I had the Crab Cake Benedict (CAD19.00) with crab,shrimp with peppers cake, potatoes, eggs benedict, and fresh fruit. My crab cakes were delectable and I could actually taste the crab and shrimp bites – so yummy! 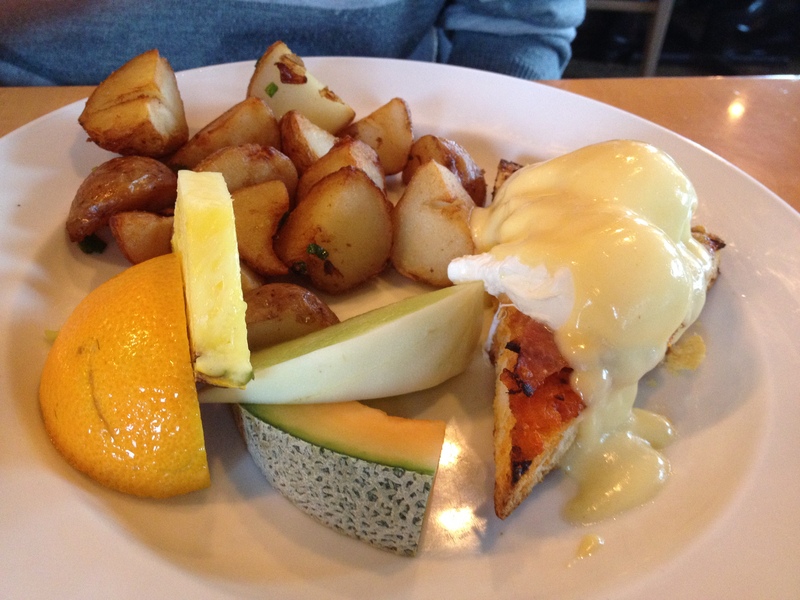 The yolk of the egg was oozing out and their Hollandaise sauce was more sour than the usual places I have had Bennies at. I’m assuming that they added more lemon juice into the mixture. What did you say when she asked if there was anything wrong? I always feel weird calculating so I use percentages if I’m paying with a card haha. I couldn’t even think clearly after that awkward situation…I said along the lines of “No, nope. nothing nope” then we quickly left.